On 23 March, we will be traveling back in time when a 350 cubic inch V8 engine was a “small-block” and American Iron ruled the road. Beginning with a meet up at Peach Park (2300 7th St S, Clanton, AL 35046), we will go east on AL-22 to the Wellborn Muscle Car Museum in Alexander City. Tim and Pam Wellborn have amassed the nation’s largest high-performance Dodge collection. It has 71 Chargers alone including a 1971 Dodge Charger R/T Hemi that his dad bought new. 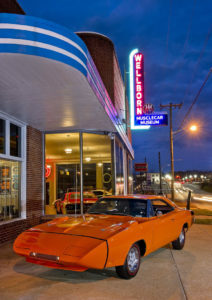 It has been featured in several magazines and TV shows and is located in a fully restored car dealership, which was built in 1944. It should be a lot of fun. Don’t be shy about bringing your Mustang, Charger or Firebird for this trip. If you bring a 2002, I bet that Mr. Wellborn would race you for pink slips at no additional charge.